If you’re responsible for the operation of projectors or displays in your organisation, you’ll know how critical it is to ensure their constant availability. In lecture theatres, museums, retail environments and many other settings, if your visual technology isn’t up and running, or if you’re faced with unexpected downtime, it can prove extremely costly – in terms of time, money and productivity. Now, however, there is a solution to the problem. Panasonic CARES – Customer Assurance through Remote monitoring and Enhanced Service solutions is a service for the projectors and displays in your business, connected via our Mobile Virtual Network, helping you maximise uptime, minimise costly interruptions and stay focused on your professional priorities. With Panasonic CARES, you receive expert, proactive support from our specialist team, saving you time, effort and budget. Including M2M equipment monitoring, maintenance scheduling and early warning software – available as either a licensed package or remotely managed service – it’s the ideal way to enhance performance, operations and product lifecycles. Most monitoring systems require direct connections between individual projectors and displays, and on-site servers. With Panasonic CARES that has all changed. Your projectors and displays are now connected to our services through a cloud-based platform – creating a true ‘plug and play’ solution. This connection operates over the 3G mobile network or LAN, providing huge flexibility and convenience, as the cloud-based information can be accessed anywhere, from any mobile device. Available in different tiers, the monitoring system connects devices, locations, the cloud platform and remote mobile devices. Every device has an external module to enable 3G connectivity, with every unit linked to an account. Every account can have multiple units connected to it, regardless of location (multi-site). Installation and set up is simple and out-of-the-box. The cloud-based remote monitoring platform handles multiple accounts and the cloud architecture allows for easy expansion and high service level agreements (SLAs). The contents of the server can be accessed from anywhere by any mobile device (via a web interface) and alarm notifications are received on mobile devices (email). Devices can be controlled remotely from mobile terminals. If you opt for a one of the higher service tiers, alarms and system diagnostics are monitored by Panasonic’s Customer Service team. The team reacts to an alarm by alerting either your internal AV team or a dedicated Panasonic engineer, depending on the tier you’ve chosen to fix issues or remotely troubleshoot and fix problems. 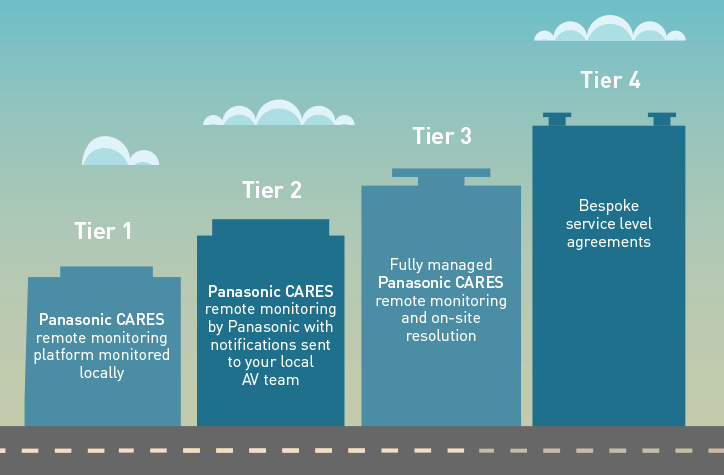 Our Panasonic CARES remote monitoring and maintenance service is available in a number of different tier options to choose from, dependent on your precise requirements. Of course, we understand that every business has a unique set of needs, so we will always look to tailor our service as closely to your circumstances as possible.